Hello everyone! First of all, I should mention that I absolutely love eyeshadow and experimenting with colours. 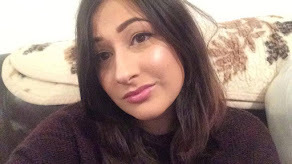 Applying eyeshadow has got to be my favourite part of my make-up routine because you can be so creative with your style and colour combinations. 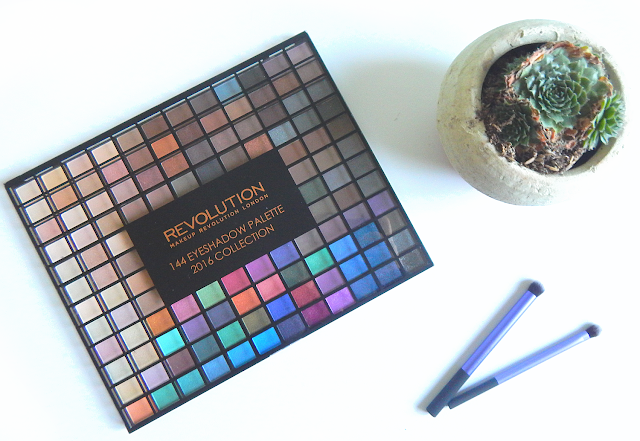 So of course when I saw that Make Up Revolution had brought out a 2016 palette that contained 144 different shadows, I just had to get my hands on it! Compared to last years collection, this has a lot more pinks, nudes and browns, which I'm happy to see as I felt like there wasn't a lot of base colours for me to work with when I was using the 2015 palette. I also feel like this years palette has a lot more shimmery shades than matte, which isn't a problem for me but I know some people who would've liked more than just matte shades that are nudes and browns. I decided to swatch my five favourite shimmer shadows and my five favourite matte shadows to show you guys and give a little description of each one and why I like it - unfortunately I had some issues with getting high quality photos and had to take them with my iPhone. 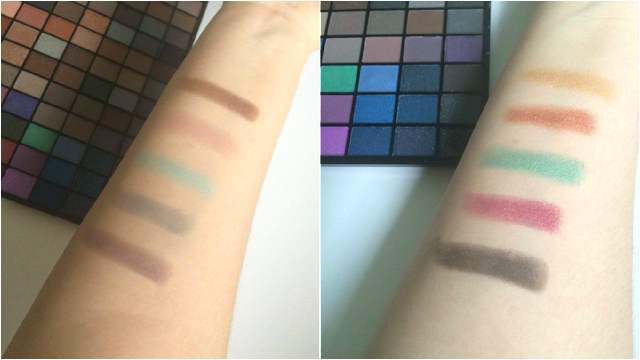 On the left is swatches of the matte colours. The first one is a lovely milk chocolate brown and a colour that I feel I will use a lot, especially on the crease of my eyelid and under eye. Second, a dusty light pink that is perfect for a simple look, or to build up to make a pink smoky eye effect. Third is a baby blue. Unfortunately, this photo doesn't do this colour any justice and it looks so much better in real life. I personally wouldn't wear this colour as blues (particularly light ones like this) don't really suit me, but as a colour by itself, I absolutely adore it. Fourth is a grey that would compliment so many other colours in the palette, especially some of the purple shimmers and the silvers that are in the palette. Last, a gorgeous purple shade, which once again hasn't been shown very well due to the poor iPhone quality of the picture. This is going to be my main go to colour and I am very excited to use it in my daily routine. 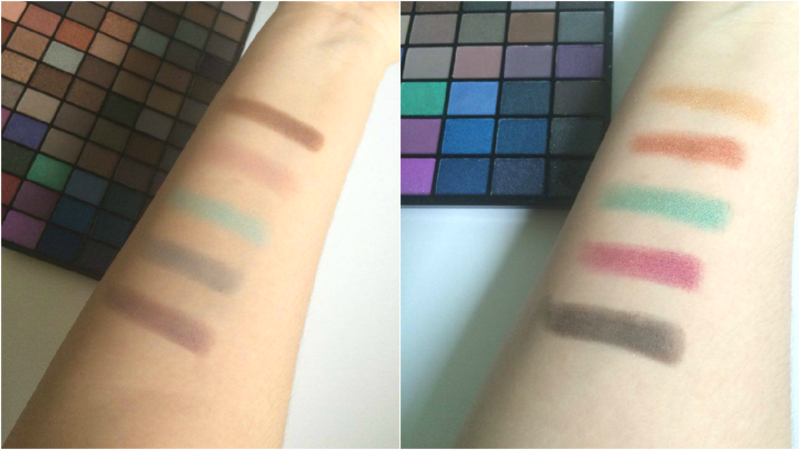 On the right I have my five shimmer colour swatches. First of all is a lovely gold, which when you have the actual palette in front of you, its really bright. This is definitely going to be my go to colour to accent my eye make-up on nights out when I'm wearing golden jewellery. The only problem I have with this colour is that it takes a lot of product to actually show up well, and I feel I'll be running out of this very soon due to that fact. Next I have a lovely copper colour. I've never really found a copper shade that I've raved over, but this one is really beautiful and eye-catching. I recommend this to any fan of copper or orange eye-shadow fans, as this one is fantastic and very shimmery. The third colour is a light turquoise, which I would never dare wear myself, but I know that a lot of people will go crazy for the colour as its bright and definitely a colour that is daring to wear. After that, we have what I would call a dark-ish magenta that has little silver shimmer bits in. This is probably my favourite shadow in the whole palette, its not too bright and not too dull, and the amount of shimmer isn't overpowering which I find some shades do have that problem. Last, but certainly no means least, is a black shadow which really does sparkle. This is going to be another one of my go-to going out shadows as I'm always wearing black on nights out, and instead of my usually matte black and shimmer golds/silvers, I can go the other way and use matte greys and shimmer blacks! Really though, the best part about this palette is that it is only £10! You can buy it from your local Superdrug or from the Make Up Revolution website. So what do you think about this palette and the range of eyeshadow shades you can get? Or have you already bought it? 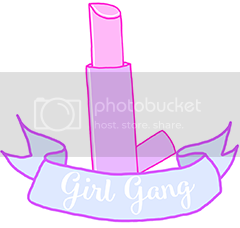 Do tell me your thoughts on it! I love the gold colours,there so pretty!